When the time came to create a logo for FABWOMEN, I had no idea where to begin! After talking to several designers and spending countless hours on the web, I felt frustrated and at a loss. So I decided to tackle this project on my own. How hard could it be, right? My initial vision was a world with the words “FAB Women” sitting on top of it. I wanted it to represent the fact that there are “FAB Women” all over the world. Personally, I thought this was quite a clever idea. Proud of my accomplishment, I eagerly shared my idea with my 13 year old daughter. What I expected to hear was, “WOW mom! That is awesome!” However, what I got instead was, “Mom, really? This is what FAB Women looks like to you?” Well, with my feelings hurt I let her know that she was welcome to come up with something better, and so she DID!!! In about 10 minutes she felt inspired, started drawing, asked me a few questions and the FAB logo was created. When I saw it, I was in AWE! How in the world did she do that? How did she capture the essence of FABWOMEN? If that was not all, she then proceeded to tell me why she drew what she drew. The silhouette of the woman was not colored, because ALL women are FAB regardless of their color. Her head is slightly tilted up, to show that is she confident, that she is proud of who she is, that she felt good about herself. The silhouette is also in motion, because she is going places moving forward with a purpose. The Star in the background has a very special meaning; it represents all of the barriers she wants to break through and shine. And, the red boots she is wearing? Well, because every FAB woman should have a pair of red shoes. 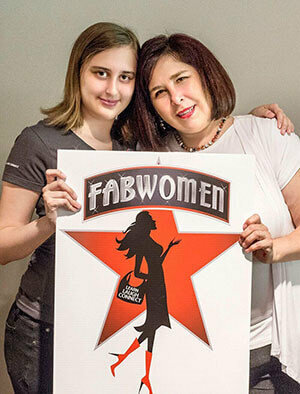 It’s funny how the vision of FABWOMEN was born and captured through the eyes of a 13 year old girl.